Like SharePoint? Like jQuery? 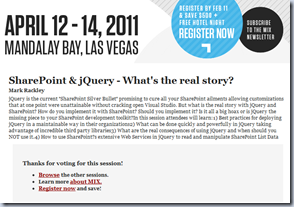 More to the point, do you hate SharePoint and/or jQuery and wish it was less painful and more usable? Well, here’s your chance to help me expand and improve upon my SharePoint & jQuery session. I submitted a session to Microsoft’s upcoming Mix11conference and low and behold they have selected it as a session to vote on. So, the power is in YOUR hands to vote for this session and get it into the conference. This would be my first Microsoft conference to speak at and I’m excited about the possibility. What’s the benefit for you? Well, the more I do this session, the more I build upon it and improve upon it to make sure you guys get the most out of it. This could only be good things for my session and blog. So, please take a few minutes to click on the link below and vote for my session and help spread the word. Voting is open until February 4th.